Carbon Black is my Level 3 Project. It is currently under construction, but will be complete soon. My level 3 attempt is planned for May 20-21 at the Millican/Brothers launch in Oregon. Carbon Black is designed around a couple pieces of 4" filament wound carbon fiber tubing I picked up from Chuck Andrus. To complement the carbon fiber airframe, the 3 G-10 fins are covered with Carbon cloth. More pictures and details are in the Construction area. Under construction. See Construction for more pictures. 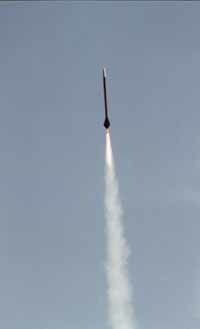 Carbon black was launched for a level 3 attempt in May of 2000. The attempt failed due to ejection charge failure. The rocket survived, and was repaired and has since flown 2 shakedown flights on a J350 and a J415. Plans are to fly it in Black Rock the fall of 2001 on an M motor. At an EX launch, Carbon Black had its back end BLOWN OFF. Click here for pics. Hoping to have it rebuilt in time for the aeropac launch in october. Brothers, OR - May, 2000 Level 3 attempt.